Additional Forms is a purchasable add-on account feature that allows Level 4 and 5 team members to send requests for more information after submitters have already submitted an initial application. For example, grant organizations can use Additional Forms to request progress reports from their grantees. Or, in a multi-stage application process, organizations can send Additional Forms to applicants who have passed an initial review stage. The Additional Forms feature is available by request for a fee. If you're interested in using Additional Forms, please contact our sales team. If your organization uses our Additional Forms feature, you'll be excited to learn that Submittable has recentlymade significant upgrades to our Additional Forms creator. Below is a list of the changes we've made. We hope you enjoy using this much improved version of additional forms! You can access additional forms through convenient navigation from any page on your organization site. 2. The additional form toolbox now includes several new tools, included dedicated fields for requesting a submitter's Name, Address, Number, and Email. 3. We've added the ability to preview your additional form as you're building it by clicking the new Preview button at the top right of the page. 4. You can now duplicate entire additional forms, as well as any form fields within an additional form (including content), by clicking on the copy icon shown below. 5. We've added a WYSIWYG ( "what you see is what you get") editor to style Text Only form fields, as well as for use in formatting any additional information below the fields (previously, no styling/formatting was available when creating these areas of a form). 7. You can now create your own label names for conditional logic branches (previously, branches were designated by auto-generated numbers). 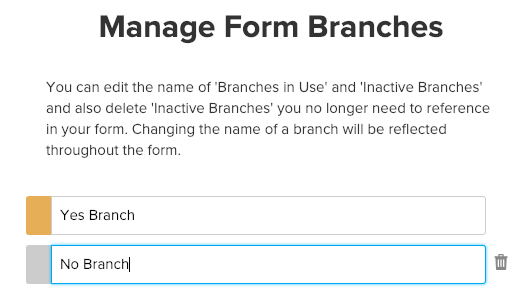 With new Additional Forms, you can add custom names to your branches, which helps to keep them organized.